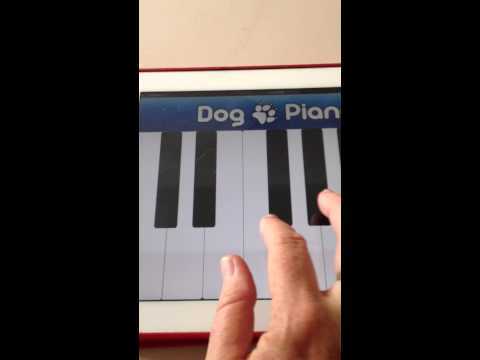 I’m no piano player but I do love dogs and this piano app is kind of novel. Each key has a different dog bark tone to it..
There’s a cat one too! Every pup or dog whether young or old, loves to be playful. Some dogs love playing with toys too. Not every dog likes to play with the same toys around. Therefore below we have summarized the four kinds of toys most owners would buy their dogs. Each toy has its own benefit and reason for being used. Some toys are more than dog toys – than can be used for teething and other toys can be used for keeping your dog’s healthy. Plush Toys – these are made of strong cloth like material and is normally stuffed and comes with a small squeaker inside. Most plush toys resemble a normal object we used in our day to day life and one that would normally intrigue a dog. Some common dog plush toys include shoes, food, mouse and the list goes on. Recently there has been a growing trend in designer dog plush toys that resemble popular items such as the i-pad, i-pawd and similar. Rubber Toys – Similar to latex toys, these can be used for satisfy an aggressive dogs chewing urges and keep the dogs overall oral hygiene in good shape. In addition rubber toys such as balls are heavier and bouncier, and so they can be even used to throw around to give your dog a daily dose of exercise. Last but not least, you can use these toys as part of their training – the basic fetch the ball treat exercise. Rope Toys-If you have a non-aggressive dog, rope toys make for fun tug-of-war games. Dogs love chewing on soft rope toys. Dog rope toys are in most cases made of materials such as nylon or cotton which is a good because the toys can be washed by machine. The dog toy will have at least one knot, and sometimes up to multiple knots to provide strength and variety to the toy. We hope this article for information. As usual please feel free to provide us with your feedback and if you like any special articles, please let us know and we will endeavor our best to put something together. Make sure you check out a the designer dog plush toys the next time you visit your local pet shop. Our store is premier shopping destination for stylish and modern dog products. Its ultimate source of finding all products meant for your loving dogs. Please Visit our websites for more information: dog supplies, dog toy and many more dog products. Sometimes it can be a drag coming up with ideas on how to spend time with your dog and his Chuckit! balls. We all want to bring out the most of playing with our dogs, especially for a more relaxing and enjoyable outdoor or indoor pet games to relieve stress from a long week’s work at the office. Even if it’s just a short time walking in the park, barbecuing in the back yard, or relaxing after dinner on the porch, pet enthusiasts always find valuable time for their dogs. I will share with you some enjoyable activities that I normally do with my pets’ Chuckit! balls. It would be best to have all the various types, since each of them have their own distinctive functions. Another thing, if it’s more outdoor plays, then do not stay in one location each day you go out with your dog. Make sure the same activity has a different location than the previous time. This will give the dog a more knowledgeable idea to different environments he lives in. Most of all, these activities you can do at any moment of your spare time. This is the activity that involves a lot of work out, training discipline, and endurance for both the dog and the owner. This definitely teaches your dog how to swim for exercise and survival purposes. You can have this activity anywhere where there is water around deep and safe enough for him to swim. One of my favorite past time after dinner, when I would just sit outside on the porch and enjoy the beauty of my front yard, is play fetch with my dog. Chuckit’s Max Glow ball definitely offers an easier way to fetch ball during nighttime. Toss this out into the front yard, and your dog would just go for the fetch. If the glow runs out, you can just simply leave it under a bright and you can go play fetching again. If you are having trouble trying to get your dog to play fetch, then try throwing a couple of dogs balls that make funny whistling sounds as they go off the air. They normally find the sounds very unusual and would catch their very attention. Chuckit! has a very decent product called The Whistler Ball. This is made of natural rubber and definitely will have every pup fetching for it once it starts whistling. Bring in the gang of adorable dog balls each with different bright colors. Toss them all simultaneously in every direction and this will keep your dog busy chasing one after another for a fair amount of time. For better interactive activities throw each in different directions in a park, and watch your dog exert its effort in finding them. Chuckit! has them in small sizes and comes in two pieces with different bright colors. They are environmentally friendly and made of recycled rubbers and are called Chuckit! Rebounced ball. 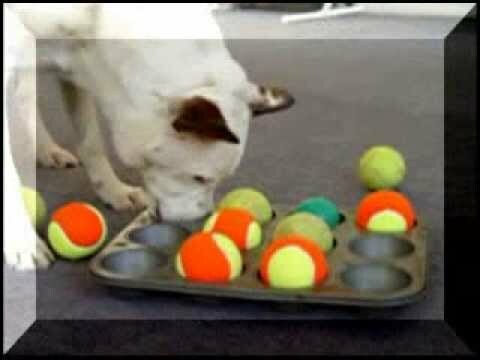 Basically these activities can provide fun and exciting interaction especially for dogs. This is mainly because they involve interesting products that keep them entertained the whole time. Eva Edwards is a writer who specializes in dog toys and dog play. You can check out her website at http://DogBalls.org, where she provides a review on a range of dog balls, like Chuckit Balls and much more. Using an indestructible dog toy is a good way to keep dogs from chewing their master’s belongings. Contrary to what others may think, dogs cannot be stopped from chewing. Their mouths are like our hands. They use them for picking up and examining things. The moment they discover a liking on how certain materials can feel in their mouth, they start munching. Telling them to stop chewing is like telling them not to breath, that is a fact. Many pet owners have gone crazy after finding out that their dogs have chewed their shoes, socks, slippers or any piece of personal belonging. This happens because dogs are naturally attracted to anything especially things that has its master’s scent. A good example is when a pet owner goes away leaving his dog roaming freely in the house. After a while the dog will start to miss him and look for him. There is no dog toy to resolve such cases so make sure to place your pet in a place where he and your stuff can all be safe. Get him a good cage where he can safely rest while you are away for a while. When starting to teach a pet to chew toys, getting the indestructible ones will always give the best value for your money. They are durable and can be used for a longer period of time. If a pet does not seem to give interest on a newly bought toy, use the scent technique. Place the toy in your hamper so it can gather some of your scent. It can also be placed inside the dog food bag so particles of your pet’s favorite food can be attached to it and make it more attractive for his mouth. A better choice of toy aside from being indestructible is one that is interactive. There are products in the market which can be inserted with treats. These are mostly toys with detachable parts. As the pet chews and discovers he can detach parts to get treats, he would want to do it over and over again. Dogs also think, hence, providing your pet with interactive toys will help a lot in eliminating boredom. An indestructible dog toy can be used for a long time so be sure to clean it regularly with mild soap and water. Also, do a constant checking on your dog’s mouth for possible teeth and gum problems. Sometimes, their chewing habit is no longer for play but a clinical problem on the mouth area that needs to be checked by a veterinarian. Luis Cameron is a pet lover and a writer at the same time. His love and passion for pets incomparable which coaxed him to share his knowledge to the world about little things that people can give their pets. Cat and Dog Supplies carries almost everything that a pet needs. They have grooming tools, harness, treats, beds, indestructible dog toy and many more. Visit http://www.catanddogsupplies.com/ for more exciting and fun stuff for your cats and dogs. People love their dogs, and they pamper them with a variety of dog toys. The important thing to keep in mind is there are many dog toys out on the market that are substandard, making them very dangerous for your beloved pet. Some toys that can be found in several different stores, many of which are imported, contain elevated ranges of deadly toxins, including arsenic, mercury, cadmium and also lead. A toy that looks like a hedgehog was purchased at a large discount chain store and was tested and found to contain high ranges of cadmium. The chemicals are ingested into a dog’s bloodstream through their saliva as they play and chew on the toy. By doing this, the dog is exposed to a large amount of metal toxins which could make your dog very sick or even cause death. Many dog toys have a squeaker inside of them, which the dog may love, but if they are an aggressive chewer, you run the risk your dog will swallow the small squeaker. Stuffed dog toys are a favorite, and they can be good for some dogs, but not all dogs. Some dogs will carry around their stuffed toy and protect it, while other dogs will chew the stuffing out of it. The dogs that chew up the stuffed toy are at risk because they may swallow the stuffing and become very ill.
Do not give your dog a child’s stuff toy under any circumstances. There was a case where a dog got a child’s teddy bear and completely ate it and became very ill. The veterinarian performed surgery expecting an obstruction, but instead found a gel type substance in the dog’s intestines, and the intestines were also black and dead. The dog died, and the veterinarian researched what was in the child’s toy that would cause the dog’s intestines to die. She found the stuffing in children’s toys contains ingredients for flame retardants and mite control. It is designed to become a gel and it is very toxic. There are also a variety of rawhide bones for dogs, but dogs that are likely to completely chew up the bones are at risk for digestive problems, or in some cases swallow a large piece of the bone which can cause an obstruction or even death. Another type of a potentially dangerous dog toy is the popular knotted ropes made out of polyester and cotton. There was an instance where a dog was chewing on this type of toy and swallowed several of the threads and they lodged in the dog’s stomach. Surgery was performed but the dog did not survive. In conclusion, research thoroughly the dog toy you are considering purchasing. Check the dog toys you have already purchased for your pet and make sure they are safe. We love our pets and do not want to unknowingly cause them harm. For safe, tested, eco friendly dog toys and cat toys, visit http://www.petbedsplusmore.com for a full line of sturdy, high quality pet toys made in the USA. They are safe for your pet. Puppies aren’t the only dogs who love to play with toys. Most adult dogs enjoy playing too. Toys don’t have to be fancy or cost a lot of money for your dog to enjoy. There are so many dog toys to choose from. Some are outrageously expensive but most are affordable, costing less than $10. When shopping for toys, you should take into consideration what type of play your dog enjoys most. Is your dog a chewer? Does he or she love chewing on things for hours on end? If so you may want to get a chew type toy. Chew toys are especially wonderful for puppies, who are teething. Chew toys also serve as a distraction for dogs with chewing behavior problems. No matter what size breed dog you have, you will be able to find an appropriate chew toy. When it comes to chew toys, don’t just give your dog an old shoe to chew on. Doing so would be sending the wrong message to your dog and telling him or her it’s okay to chew up shoes. Instead spend some money on a chew toy with good reviews. If other people’s dogs have enjoyed the chew toy then your dog is likely to also enjoy the toy. Most dogs also enjoy playing fetch. Playing fetch is great exercise for a dog and a good way to help calm down an energetic dog. One of my favorite dog fetch toys is the Chuckit Flying Squirrel. It similar to a Frisbee but easier for your dog to pick up and it floats too! Your dog will have hours of fun playing fetch with this flying squirrel. At the time this article was written the flying squirrel was about $10. The squirrel is durable even for dogs who are rough on toys. One of my favorite places to look for dog toys is on Amazon. Reading customer reviews on toys you are thinking about purchasing can give you a lot of insight as to whether or not your dog will enjoy the toy and actually use it. The free shipping Amazon offers with most purchases only adds to the appeal of shopping online. Why go drive in traffic and stand in long lines when you could shop from the comfort of your own home? Sure there’s the instant gratification you get from purchasing something in person and taking possession of the item right away but it’s also fun to get a package in the mail, the anticipation is quite fun and if you are saving money to boot, why not? Of course you could head down to your nearest Pet super store and buy a toy for your dog. With all the unconditional love our pets give us everyday, why not splurge on your dog and get them a new toy? Find out all about the Chuckit Flying Squirrel and discover the best dog toys at Kraken Corgi dot com. Do you have a dog with lots of energy? Not sure how to channel that energy? Today’s market has a lot of dog toys to help you and you dog release some of that built up energy. There are toys for you and your dog to play with together, and toys that will challenge them mentally and help to wear them down. Frisbee’s and tennis balls are some of my favorite dog toys for high-energy dogs. Playing fetch with your dog is not only good exercise for them; it’s a great way to build that bond that we all want with man’s best friend. When choosing a Frisbee for your do, you will want to make sure to choose one that is designed to be easy on their mouth. Tennis balls are fun, but if you’re not used to throwing one, you can really exhaust your arm. There are several dog toys made today that are designed to make it easy for you to throw tennis balls. Many are designed in a way that enables you to pick up the ball and throw it without having to touch it, and therefore, keeps your hands clean. Also, there are a variety of toys that will help to challenge and stimulate your dog’s mind. These will help tire him out mentally. Kong dog toys are a great way to keep them busy for hours. It allows you to insert a treat inside the toy and will keep him thinking on how to access the treats you can also find recipes for your Kong toys that will give your dog a variety of tastes. He will be eager to discover what treasure he’ll find each time he gets his Kong. To further stimulate the mind and body, there are also a number of toys different then the Kong where food is inserted. The dog has to maneuver this toy around the floor in order to get the hard food to fall out of the holes in the toy so he can eat it. This also helps to slow down his eating. Also, there are interactive dog toys designed as puzzles that stimulate the brain. The mental challenge is finding the treat and how to get it. He will then need to use his physical dexterity in order to obtain the treat. He not only gets the mental challenge of finding the treat in the puzzle and figuring out how to get it, but, he will need to use his physical dexterity in order to obtain the treat. In conclusion, I have mentioned just a few ways to help keep an energetic dog busy and happy. My favorite activity will always be playing fetch with a Frisbee. This activity will definitely keep your dog happy and fit. The end result will be a special forever bond between the two of you. For more information on dog toys and other dog products visit http://www.petcollarshop.com/. The Kong range of dogs, cats and birds are innovative, long lasting and are almost any pet owners essential, once they try them. At the heart of the range is a superb product simply known as ‘Kongs’, which are intended for dogs. Made from durable rubber and in a number of types there really is a perfect one for every pooch. So what does it do? Simply put it’s a toy, but used in the right way can become an innovative a simple training aid or even a house saver if your dog suffers from separation anxiety. Generally they are formed in a ‘blobby’ cone shape or a hexagonal cone shape, with a large hole in one end and a smaller hole (for ease of cleaning) in the other. This unique shape helps them to bounce, roll and balance like no other dog toy. But there is more, the hole can be stuffed with treats and depending on what sort you use, can transform the Kong for different purposes. For example, you can use small bits of your dog’s favourite kibble, which will come out when rolled or thrown. This makes a great interactive toy for any dog, it also provides mental stimulation as they roll and shake the Kong to get to the treats. However, Kong ‘Stuff ‘em’s’ are a fantastic biscuit with a strange shape, that get wedged in the Kong. This can be fun for your dog as he eventually gets them out or can be used as a training aid for retrieving, as you can easily remove one treat as a reward for bringing it back. Kong also has practical applications. You can leave the Kong toy as a distraction for dogs that become distressed at being left. Putting tasty morsels in the Kong and sealing it with either frozen cream cheese or Kong ‘stuff’n’ paste makes a great distraction. The dogs become so engrossed at getting the food by the time they have, they forget about you leaving, gradually reducing the stress they feel when you leave the house. Another great idea is stuff the end with a treat or kibble, then filling with water to be frozen. In hot weather this makes a fantastic treat that helps keep dogs cool! But surely all this food and fun would make the dog love it to death? Well Kong have even thought of that. The Kongs come in different sizes, from puppy to small, medium, large and even giant! Along with these sizing they have different softness. For puppies a different type of rubber is used, so they are soft on gums and aid teething. The small medium and large come in the standard softness, which is durable enough not to be broken or ripped but still kind to your companion’s teeth! But what about the dogs that can seemingly chomp their way through anything? Well the medium, large and giant sizes come in a variation called ‘extreme’. This type has the most solid rubber and is virtually indestructible, making Kongs a good investment. Found this in a book in Germany. Dogs love this game. Keeps them busy for a few minutes.